Windows Developer Center: I coordinated and managed content for this site. Windows Touch: I was the content owner for this Windows 7 feature. Tablet PC: I was the content owner for this Windows feature area. 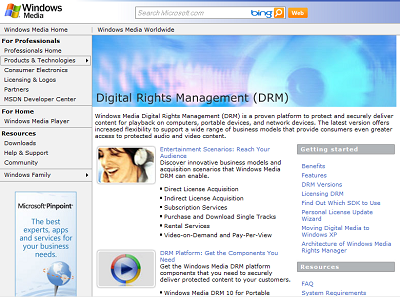 Windows Media DRM: I owned content for network, server, client and portable devices DRM. 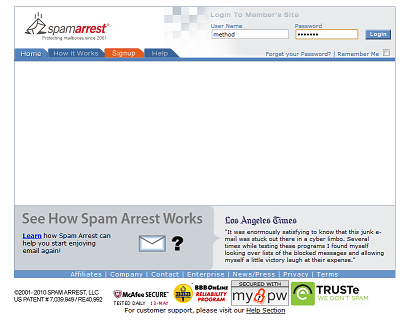 Spam Arrest: I coded the backend and UI code for a major revision to the site. Catalyst QuickPoll: My first professional development experience. I am currently working on Google+ to grow the 3rd party ecosystem. 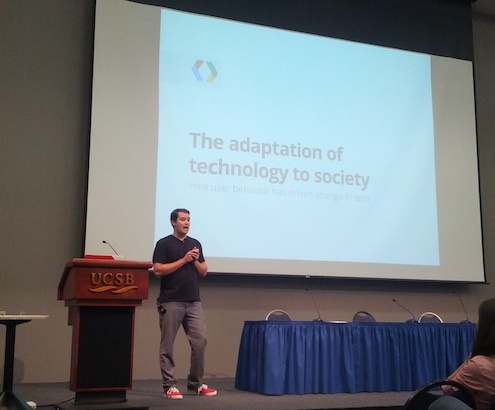 Delivered Google+ ligntning talks at meetups in San Francisco and field trips at Google. 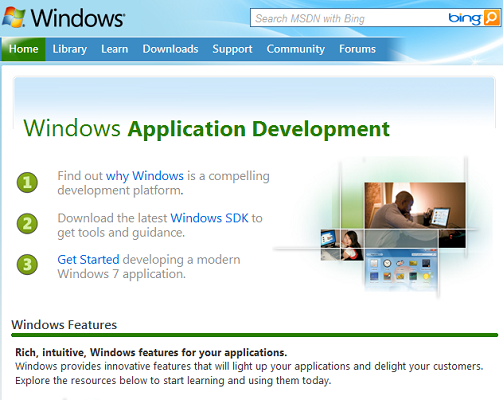 I was the content project manager for Windows Developer site on MSDN. This is the starting point for developers who are targetting Windows and the site currently has around 50,000 visitors a month. Coordinated the creation and presentation of resources. Reorganized the site based on feedback from analytic data and developer initiatives. Drove the creation of the samples gallery tab. Coordinated the Hilo project's exposure through the developer center. Coded samples demonstrating Windows features. Drove social media presence for the site on Facebook and Twitter from 0 to more than 10k qualified developers. Coordinated between marketing, evangelism, content, and program management teams. Kept the feeds and content vibrant by integrating video, samples, and learning pathways in the developer center. I was the content owner for the Windows Touch content in the Windows 7 timeframe. Worked with program managemers, testers, and developers to create a compelling story for Windows Touch. Created reference documentation for all public APIs. Authored and published and article on Enhancing Mobile Applications for Touch. Created code examples demonstrating best practices for coding for Windows Touch. 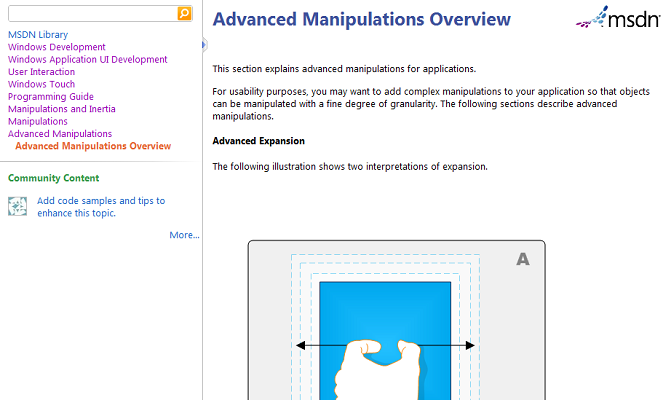 Worked with art resources to create graphics that help explain complex Windows Touch concepts. Created code samples that demonstrate how to create applications featuring Windows Touch. I was the content owner for the Tablet PC content in the Windows Vista/Windows 7 timeframe. Worked with program managemers, testers, and developers to create a compelling story for Tablet development. Authored and published an article on Ink-enabled Apps for Tablet PC. 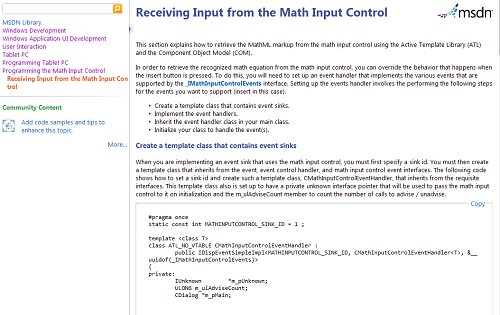 Created code examples demonstrating best practices for coding event sinks such as the Math Input Control. Worked with art resources to create graphics that help explain complex Tablet PC concepts. Created code samples that demonstrate how to create applications using Tablet PC features. Engaged with the developer community through forums, social media, and at conferences. I was the content owner for the Windows Media DRM Server, Client, Network Devices, and porting kit documentation. Worked with program managemers, testers, and developers to create a compelling story for Windows Media DRM. Created code examples demonstrating best practices. Revised the Windows Media DRM for Network Devices specification to incorporate the protocol for OCUR and PBDA. Created code samples and iterated porting kit code to simplify development of compliant portable devices in C.
Created code samples that demonstrated content protection over the network in various languages including C/C++/Java. Created the initial specification for "Copy From Device" functionality that ended up in the Zune. Created the documentation that clarifies how to create a DRM-enabled store. Created a blog that evangelized DRM and was featured as an influential Microsoft blogger on a panel that included prominent Microsoft bloggers. Spam Arrest, an internet startup, was the first job I got out of college. I learned Enterprise Java and coded various scripts that enabled the online email provider and anti-spam software to function. Implemented major site revision incorporating IMAP-based webmail in Java. Surveyed, selected, and integrated commercial off the shelf software packages for webmail, SNMP monitoring, antivirus, and analytics. Coded JNI interface for antivirus integration. Scaled database and site to n-tiered architecture. Coded tiered caching using MySQL, session-based caching, and MemcacheD. Coded JSP pages for content presentation. Coded SNMP agents for server monitoring. Coded data migration scripts for moving users to new databases. Coded backup scripts for data backups and replication. Worked on call 24 hours a day and responded to issues in real-time. While working at the Center for Teaching Learning and Technology, I developed a simple polling tool that has been adopted by University of Washington professors over the past decade. Coded CGI/Perl using the Catalyst framework. Coded CGI/Perl frontend and incorporated security features. Integrated UW NetID authentication for protecting surveys. Copyright (c) 2014 gusclass.com. All rights reserved.